If you are approaching from Glasgow take the A82 towards Crianlarich, then Tyndrum, and the A85 towards Oban. The journey takes approximately 2 hours. From Edinburgh aim for Stirling and take the A82 to Lochearnhead, then the A85 via Crianlarich to Oban. 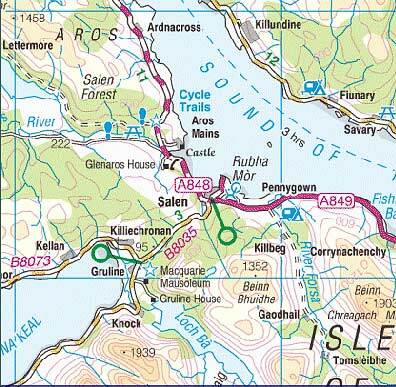 aim for Fort William then take the A82 to Ballachulish and the A828 to Oban. OR 7 miles South of Fortwilliam take the Corrran ferry across the Loch Linnhe then follow the signposts for Lochaline. There are two return journeys from Oban to Glasgow Queen Street Station each day. Timetables are available from Scotrail, telephone 08457 484950, or see details on their website ( website http://www.firstgroup.com/scotrail/index.php). 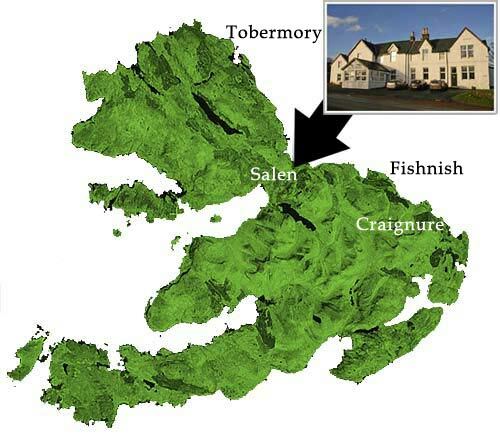 (Oban - Craignure or Lochaline - Fishnish). Sailings are regular during the summer but booking arrangements and check in times do vary. Guests are advised to make a reservation on the Oban - Craignure route for any vehicle in advance. From the Ferry terminals at Fishnish or Craignure take the road heading North which is sign posted to Salen. The Hotel is by the road side in the centre of the vilage.